At first I thought this might be the Green Utility Coat of Doom – but thankfully, it has a different collar and fastening system. This coat, though, is of a similar style, just less heavy-duty. It has a sharp edges collar, shoulder epaulettes, and the breast pockets and middle do up, in part, with large green buttons that match the colour of the coat. In Celebrating the Life of Asa Fox (12x06), Dean shows up to Jody’s place wearing this coat. He takes it off shortly after they arrive and does not wear it again. In Regarding Dean (12x11), Dean wears this coat for his hunt of the witch through the woods, and his subsequent awakening in the park and trip to the waffle house. 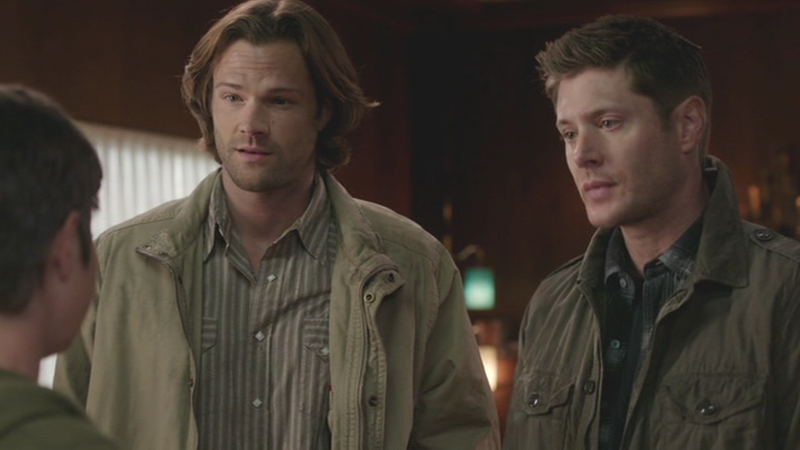 In Family Feud (12x13), Dean wears this coat when they’re in the car on the way to the case. He then wears a suit for a bit, but puts the coat back on when they go to pick up Gavin at the bus depot. He wears it until they go back to the Bunker to send Gavin back in time.